The idea here is to have each student in your class create a hat, and then decorate it using Earth Day as the theme. While the basic hat shapes will be the same, each child’s surface decoration will be distinct and unique, making each hat a personal statement about how that child feels about protecting and celebrating the earth. You will need one sheet of 18X24 inch construction paper for each child in your class — color choice is up to you. You will also need a stapler, any type of glue, scissors, and lots and lots of discard materials for the students to choose from. This could be anything from a scrap paper box, to things like, ribbon, buttons, cotton balls, tooth picks, fabric, feathers, tissue paper, brads, yarn, pipe cleaners, glitter, etc. This art experience is the perfect time to use up a variety of random things you have on hand, and to recycle old things into something fresh, fun, and new! 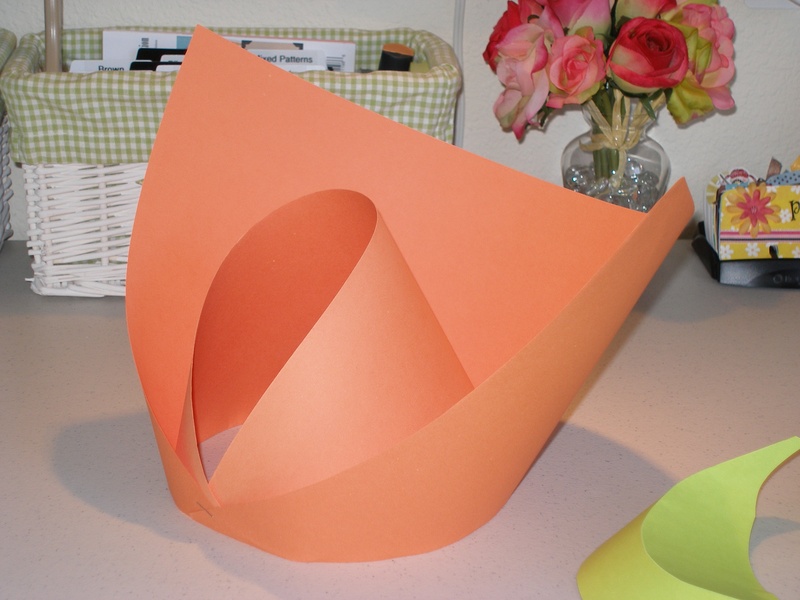 To make a basic hat, just make one simple scored line in a half circle shape on the long side of a sheet of 18X24 inch construction paper. (See diagram below.) If you’ve never scored paper before, you will simply drag the pointy end of a pair of scissors — or even the tip of a paper clip that’s been bent open will do — gently across the paper. 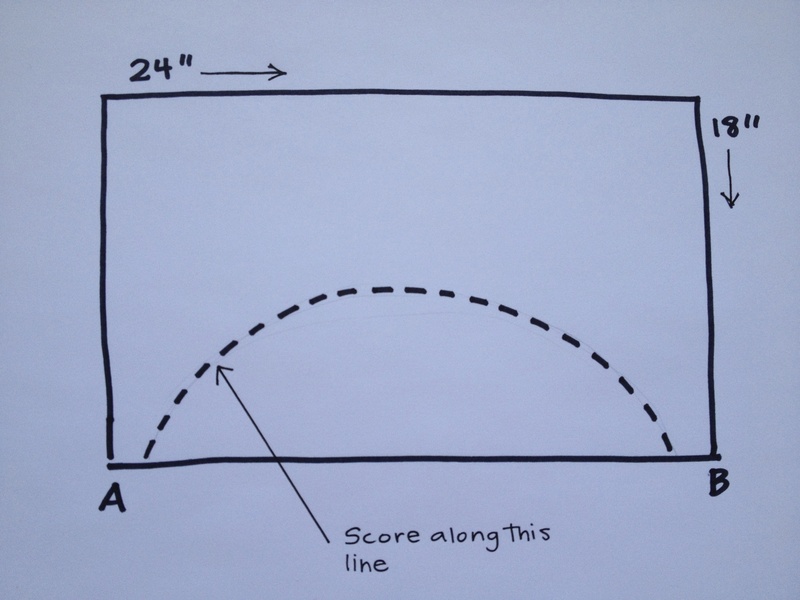 This “scored” line that you’ve just created will allow you to then fold the paper along this curved line. (Scoring as a technique is amazing! Once you start exploring it, you’ll be hooked!) Attach points A and B together with a staple, and you’re done. Super simple! (In the photo at the top of this post, you can see this stapled connection point at the back of the hat.) 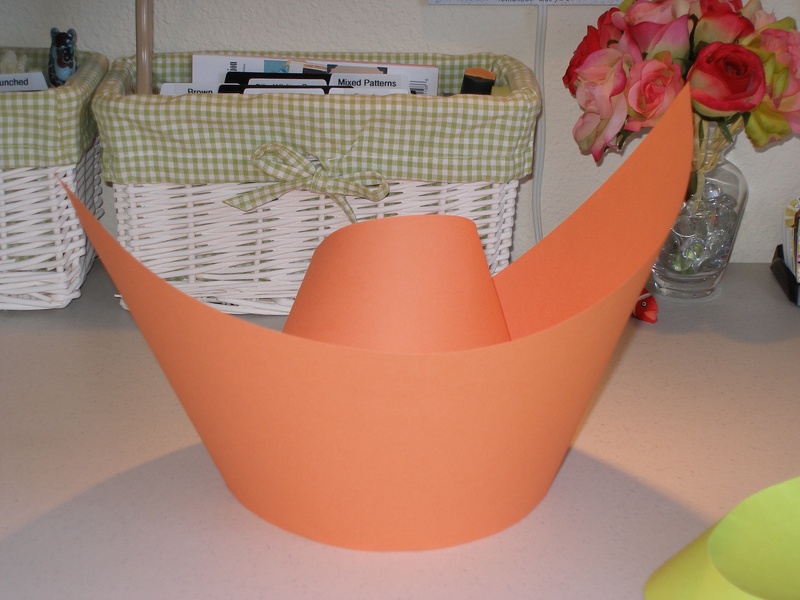 If you’re working with very young students, it might be a good idea to have the hats made ahead of time for them so that they are all ready to be decorated. Scoring takes a little bit of practice so as not to cut through the paper while you’re doing it, but after a few tries, you will learn what amount of pressure is just right. If Earth Day is going to be your theme for hat decoration, it might be a good idea to spend some time talking with your students about all of the different ways they could decorate their hats to show how they feel about protecting and celebrating the earth. They could cut out letters to include words on their hats, they could cut out, or tear out, and create symbols to place on their hats (think earth, sun, clouds, water, plants), they could add fun, three dimensional things to their hats such as paper streamers, ribbons, and more. (I would strongly suggest that you not use drawing materials such as markers, crayons, or pencils for hat decoration, as drawings tend to lack the excitement and involvement that other types of surface decoration provide.) Perhaps this brainstorming could be captured as a list that the students could refer back to while they work?